As we reach the final stages of our year-long residency at King’s College, we give an update on the progress made over the last two terms. In 2018 we received grants from The Guildford Poyle Charities and The NatWest Skills and Opportunities Fund towards A Time for All Things, a year-long residency at King’s College in Guildford. This programme would provide 300 minutes of Shakespeare workshops for all 5 year-groups in their 2018-19 academic year. In the Autumn term of 2018, all students received a performance of their chosen Shakespeare text. Three actors and a facilitator presented the cut version of each play, assisted by student (and teacher) volunteers. Students engaged with the text as a performance piece and our professional staff highlighted important context, key themes, imagery and interpretations. This ensured that all students began their study with the same level of knowledge and established common reference points for further classroom study and workshop exploration. In the Spring Term of 2019, we returned with detailed follow-up workshops for each year-group. Two Actors and a facilitator delivered content, written in collaboration with the teachers, to target each year-group’s specific needs. The sessions were organised into two sections. 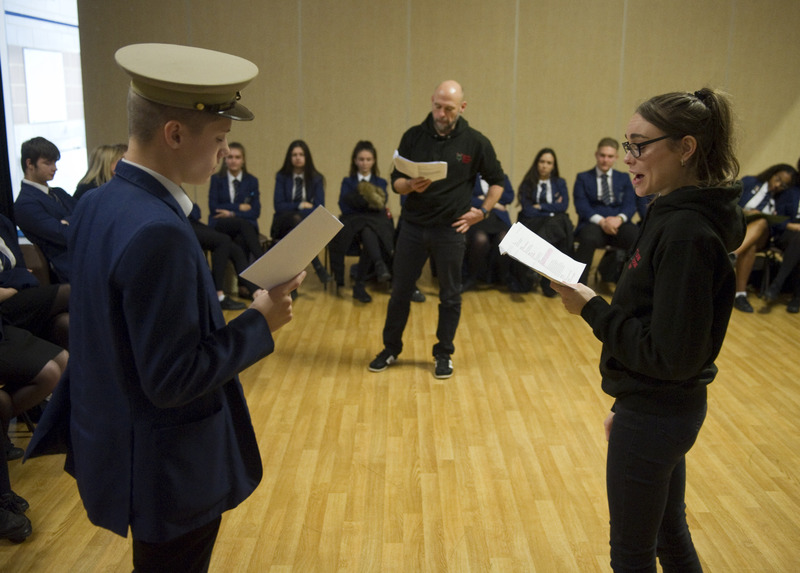 The first allowed the actors to take the lead, demonstrating exercises and exploring scenes, before the students redirected the actors and engaged in discussion around the play’s poetry, characterisation and other dramatic elements. The second section gave the students a chance to follow the actors’ example and explore other practical exercises in smaller groups. In the Summer term, 2 actors will work with each year-group, allowing us to tackle the plays in even greater detail. The teachers will instruct us on the content, based on the student’s work in the classroom, so we can explore new areas or re-visit parts of their curriculum which would benefit from further clarification. These workshops will be more student-led than the previous sessions, allowing us to build on their increased confidence and knowledge. We hope to continue the project year after year, building on the student’s increased knowledge and confidence, so that Year 7s have the chance to engage and grow with the programme throughout their entire secondary school life. King’s is placed in the top 10% most deprived boroughs in the country and only 22% of students at King’s will obtain 5 GCSEs (including Maths and English). After just one workshop with us, the students showed an average 62% increase in their capabilities, including greater engagement with Shakespeare’s text and wider classroom activities.